The home of country music in USA Nashville also houses the Athena Parthenos, the highest indoor sculpture of the West. Besides being the capital of Tennessee, Nashville is also the seat of Davidson County. It has an aggregate area of 526.1 square miles and an estimated population of 626,681. The estimated per capita income of this city is $23,609. Christianity is the major religion and English the predominant language. Native Americans belonging to the Mississippian culture were the first possible settlers of Nashville. They inhabited the area from almost 1000 to 1400 CE and were primarily farmers. The city proper was found in 1779 and developed quickly thanks to its location near the Cumberland River. The city was incorporated in 1806 and became the county seat of Davidson. It became the state capital in 1843. Nashville was hit hard economically after the Civil War but it bounced back quickly to become an important trading and shipping destination. It also became a manufacturing hub. From the 70s Nashville has seen high rates of growth, particularly during Mayor Phil Bredesen's term. Music is a major component of Nashville's economy - the city is among the top music production and recording centers in USA. Almost every major and independent music label has an office in Nashville. Since the 1960s it has had the second largest music production center in USA following New York. On an average the music industry contributes $6.4 billion every year and provides almost 19,000 jobs. Along with music, tourism and health care are important sectors. There are more than 250 health care enterprises in the city. This list includes the Hospital Corporation of America. Unlike other cities, Nashville's economic strength lies on its music industry which is estimated to have a total annual economic impact of $6.4 billion. Healthcare is the other major industry that contributes to the city's healthy economy with $18.3 billion a year. The automotive and film industries are also major economic drivers of the city. The city is also a hub for major industries including insurance, finance, publishing, health care, music and transportation. Nashville offers many tourist attractive places such as Ryman Auditorium-the home of the Grand Ole Opry, Cheekwood Botanical Garden and Museum of Art, Tennessee State Museum and T.C. Steele State Historic Site. The visitors can learn, enjoy and relax by visiting such places. The city also provides a number of resorts to the tourists. Seasons Lodge & Conference Center, Abe Martin Lodge, Cornerstone Inn, Brown County Inn, Abbey Inn and 1875 Homestead Bed & Breakfast, all of them offer tailor-made reception to its guest. The districts of Nashville constitute important parts of the well laid out administrative set up of the city. 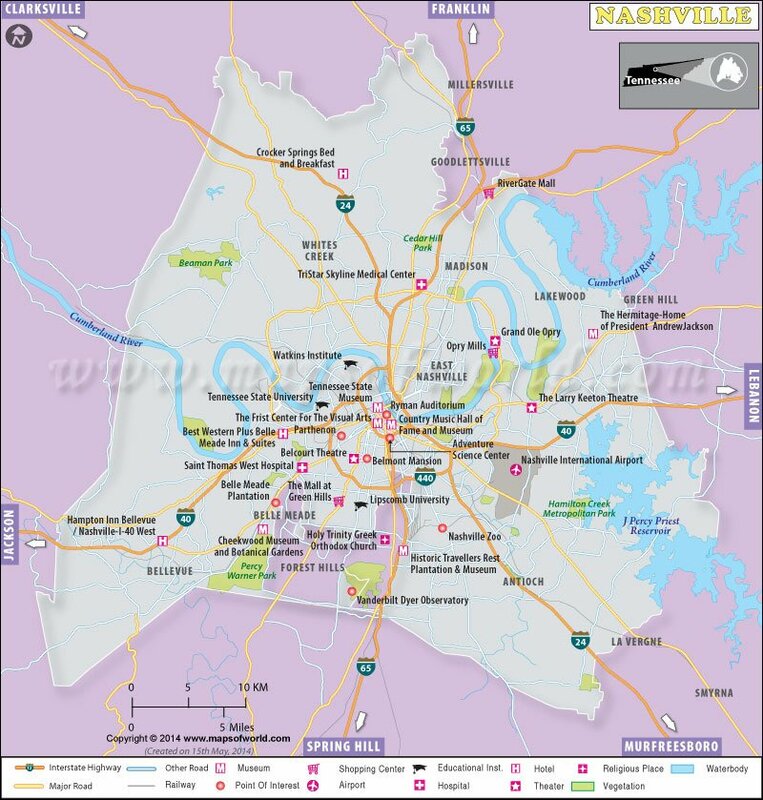 Apart from the top hotels like Courtyard by Marriott - Vanderbilt/West End and Gaylord Opryland Hotel and Convention Center tourists can also opt for the hostels in Nashville. Tourist attractions like Country Music Hall of Fame and Museum and Belle Meade Plantation make Nashville a preferred tourist destination. Festivals such as Nashville Film Festival and Country Music Marathon represent the glorious performing arts heritage of the Tennessee city.